Up past Brighton Beach you’ll find a little neighborhood nestled between Highway 61 and the far eastern reaches of Superior Street, from 72nd Avenue East to Pleasant Avenue. It includes Brighton Street, just below and parallel to Highway 61, and just one other roadway: Chase Avenue, named after one of Duluth’s most influential and nearly forgotten pioneers, Albert Stillman Chase. Usually known as A. S. Chase in Duluth lore, Chase was born in New York State in 1844 to a prominent New England family. His physician father died in 1859 in Rochester, Minnesota, only a year after moving the family west. When the Civil War began, young Albert enlisted as a private in the Sixth Minnesota Infantry, which spent the war fighting Dakota Indians in Minnesota. He took part in General Sibley’s expedition to the Missouri River, but nearly died during an outbreak of illness that killed many of the men in his company. After his discharge at the end of the war, he joined his brother in the shoe and boot business in Owatonna, but their company failed. In 1870 Chase relocated to Duluth, where he promptly took part in the first printing of the Duluth Tribune (eventually the Duluth News Tribune) as a typesetter, a skill he’d learned as a youth. Within a year he was working as a clerk for the Lake Superior & Mississippi Railway, eventually becoming the joint agent for the Northern Pacific and LS&M in Duluth. After the railroads divided in 1875, he worked exclusively for Northern Pacific. By the time he quit in 1887, he was General Manager of the railroad and had reportedly not missed a day of work since he started. He sold his interest in the Street Railway Company in 1891, after which he and his brother K. D. began laying track for the Duluth Missabe & Northern Railroad. The brothers operated the DM&N until they sold their stock to the Merritts in 1893. Aside from being a railroad man, Chase participated in the usual Duluth moneymaking ventures: banking, mining and real estate. He owned property all across Duluth (including the location of Chase Avenue), and invested in companies like Malleable Iron and Minnesota Match. He was a principal investor in the Little American Mine in Rainy Lake and got involved in gold mining in Prescott, Arizona. He also served on the board of the Duluth Chamber of Commerce. Throughout his life in Duluth, A. S. Chase remained a single man—a “clubman” and “confirmed bachelor.” That is, until he and a friend undertook a journey to Battle Creek, Michigan, in 1903. The pair likely spent some time at the trendy Battle Creek Sanitarium, which modern folks might be familiar with through the humorous film and book, The Road to Wellville. There, at age sixty, he met twenty-year-old Minnie Scott Douglas of Lima, Ohio, whom he promptly married. 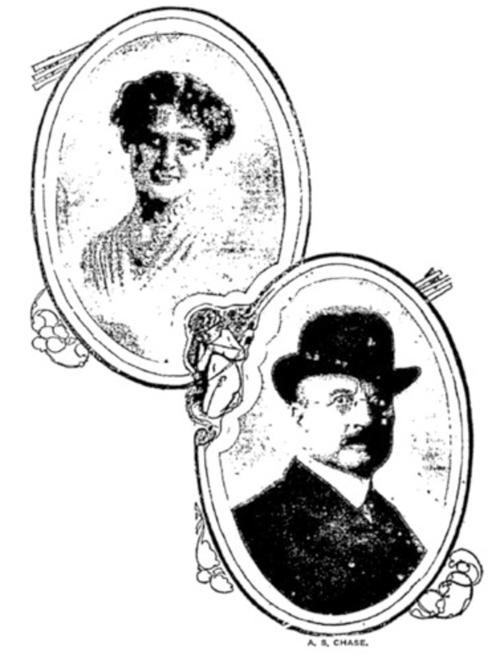 Duluth announcements of the nuptials could not hide the stunned community response, one which seems to have led to the couple’s brief, abortive residence here and quick departure for Faribault, where K. D. Chase had established himself and was elected as mayor in 1900. The couple had one son, David O. Chase. I remember when Duluth was little more than a cowpath and a couple of houses…. I have always believed Duluth was going to be a great city and everything I see today convinced me that my belief has always been well founded. Practically all my property interests are right here and I consider Duluth my home in many ways. I have been paying taxes on some property in West Duluth for 20 years and no one before wanted to buy any of it…but today I have had a great many inquiries about it and could have sold a large part of it at a good figure. To me, naturally, that is a very convincing bit of evidence that Duluth is growing fast and is prosperous. I don’t like California, and I would like to come back here—I may do it. I haven’t been able to make up my mind. Duluth is my first love, and it is hard to break away from my old friends here. He never did return to live in his “first love.” Albert died in 1927, and five years later, Minnie married Albert’s nephew, Kelsey Stillman Chase, also a widower. Minnie lived on until 1973. Remarkably, as late as 2010, David O. Chase was still alive in Cowichan, British Columbia. He was 100 years old, and was being celebrated for environmental preservation and his status as one of the two last living children of Union Army soldiers remaining in all of Canada.